School teaches us a lot… but not everything. 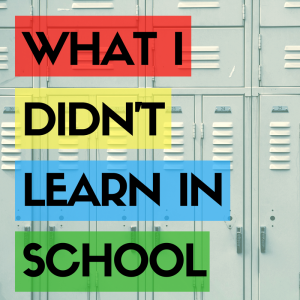 This month we asked you to share the lessons you had to learn outside the classroom. Some takeaways were practical (“You can burn macaroni and cheese.“- ColtonSallo), while others waxed philosophical ( “I’m worth more than a grade.“-TrashcanDiary). Some lessons could only be learned after graduation (“I can pee without a pass.” –DaveDigger) or after your first job (“You can’t copy at your job.”-Joanterra). Our teachers taught us everything we needed to know about Shakespeare and WWI, but ABeautifullyBurdenedLife knows that some lessons are better left to the rich and unplannable pageant that is life: “Life’s Greatest Teachers: Grief, Failure, Love.” Here are a few more things the Six-Word community learned along the way. Congratulations to Lac and zsuzsu!